While some may associate the rustic look of algae, lichen, or moss growing on a roof with picturesque cottages of the Pacific Northwest or the swamps of the South, these roof-clinging pests can cause some serious damage to your roof. Whether you are trying to resell your home or noticing leaks and water damage in your attic, it might be time to deal with these pesky plants. If you are looking for a trusted roofing service in Tennessee to help you with your roof repair, visit Tim Leeper Roofing. If you need to replace shingles damaged by lichen and moss, or are considering redoing your roof with anti-moss and anti-algae shingles, Tim Leeper Roofing can help you and your roof today. Call us at 615-553-2782 to learn more. If you are wondering what those weird, dark stains on your roof are, it is most likely a blue-green algae known as gloeocapsa magma. 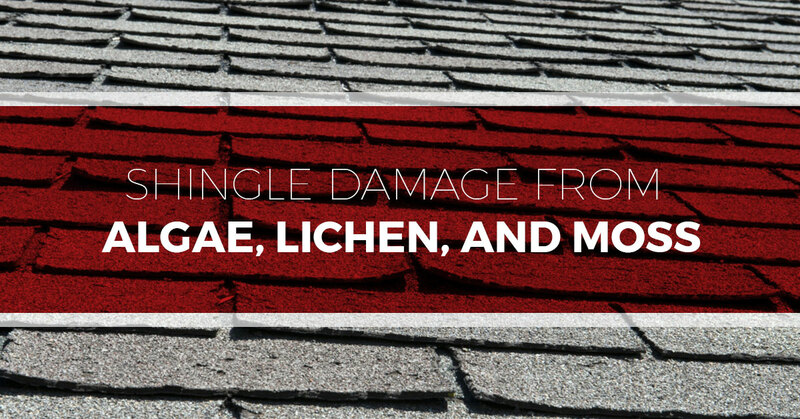 While this algae will not damage your roof or shingles, it may hurt the value of your home. The staining can be an eyesore, and it immediately signals to a potential homeowner that work needs to be done on the roof. This algae thrives on shady, low-sloped roofing. Because water tends to evaporate slower on these types of roofs, algae set up shop in these damper sections of your roof. But how do the algae get there in the first place? Algae are airborne, and there is little you can do to prevent the spores from landing on your roof; however, making sure your roof receives adequate sunlight is one step to stopping the algae growth. In addition, you can use anti-algae shingles that have metals embedded in them. You can also ask your roofing contractor about installing copper, aluminum, or zinc in all the ridges of the roof. Another way to prevent algae growth is to hire a licensed roofing contractor to clean off any algae and do roof repairs as needed. This is best done in early winter, as there are few leaves, and the repairs made will prepare you for winter. As far as removing the algae, there is one thing you must avoid at all costs: power washing. If you power wash your roof — unless you have a metal roof — you will strip the aggregates off of the shingles, and possibly destroy the shingles themselves. For all intents and purposes, moss and lichen do the same thing to your roof: hold moisture and, when removed, erode the shingles they were attached to. The biggest difference between these two pesky growths is lichen’s durability. Lichen can survive on your roof for months without any rainfall or water exposure. It is also significantly harder to remove from your roof as it binds to the minerals in the aggregate of your shingles. Moss presents a tricky problem for your roof. Not only does it hold moisture and erode the shingles, if it is dislodged, it can clog your gutters. Again, it is important not to power wash moss from your roof; doing so will lead to more harm than good. Instead, try using a flexible leaf rake to remove the moss gently. Lichen, on the other hand, are extremely durable. Like moss, lichen holds moisture wherever they are present. They also can grow underneath your shingles and interfere and push the shingle upwards, dislodging it and preventing it from performing its function. To remove moss, lichen, and algae from growing on your roof, chemical solutions are some of the most effective. Take special care to wear protective eyewear, gloves, and particulate mask. Also consider washing off plants and grasses near your roof as they may have been exposed to the chemical solution meant to kill moss, lichen, and algae. While chemical solutions aren’t environmentally friendly, and may even erode your shingles, at least you got the stuff off your roof. If you don’t feel comfortable handling the chemicals or being on your roof, contact a trusted, certified roofer to complete your home improvements. Staying on top of moss, lichen, and algae build up can be stressful. One of the best, long-lasting ways to keep your roof clean of these pests is to install metal flashings or ridges. Be sure to talk to a certified roofing contractor before you do attempt to do this. If you want a trustworthy company to install your copper, zinc, or aluminum flashings to help prevent moss, lichen, and algae growth, go with Tim Leeper Roofing for all of your roofing needs. Tim Leeper Roofing is dedicated to making your roofing repairs and modifications the best. From the moment you talk to our team to completing the job, we strive for excellence at every turn. For a quick quote on roof repairs, call us today at 615-553-2782.